As the population ages, Toronto Injury Lawyer Brian Goldfinger and his team at Goldfinger Law are seeing more and more car accidents involving the elderly. Let’s face it. The elderly have been parodied over the years on television for being slow and cautious drivers. There are even insurance companies that offer special rates for older drivers rewarding them for their exemplary driving record for not getting into any car accidents. Today, there are a record number of drivers age 65 and over in the roads across Ontario. But, as these people and get older, their reflexes, vision, hearing, depth perception and peripheral senses all deteriorate. This results in a safety hazard to both themselves, and their fellow drivers on the roads. In Toronto, London and Peterborough, our law firm has seen an increase in car accidents causing injury caused by, or involving the elderly. These car accidents have resulted in devastating injury including but not limited to brain injury, loss of limb, paraplegia, spinal cord injury, broken bones, ankle fractures, chronic pain, psychological injury and chronic pain. Often times, the old people responsible for the car accident tell our lawyers that it’s the first time they’ve ever been involved in a car accident. They are truly deeply sorry for having caused our clients pain and suffering. Sometimes, their doctors identify that their senses are no longer what they used to be, and send a notice to the Ministry of Transportation that they aren’t fit or no longer capable to drive given their deteriorating health conditions. Speaking of health conditions, we have seen elderly people causing car accidents because they’ve experienced a seizure while driver, driven without their eye glasses, driven after taking medication which made them drowsy, didn’t see the light change because their vision was impaired, or got distracted while driving for no apparent reason. These accidents have resulted in devastating t-bone collisions, hit and run accidents and even head on collisions. When an old person is involved in a car accident for which they aren’t responsible, they may be entitled to additional compensation for their pain and suffering from the at fault driver. Courts in Toronto, London, Peterborough and across Ontario have long recognized the “Golden Years Doctrine”, which places greater economic value for the few remaining lost years of an older person compared to the increased life expectancy of a younger person involved in a similar fact car accident. Goldfinger Law has helped many of our elderly clients recover increased compensation for their pain and suffering following a car accident by virtue of this legal doctrine. 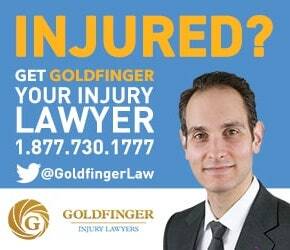 If you or a loved one has been involved in a car accident caused by an elderly person, or an elderly person was the victim of a serious car accident, the lawyers of Goldfinger Law are here to help. With offices in Toronto, London and Peterborough, we are here to serve you. If you or your loved one can’t make it to one of our offices, we will come out and meet with you for a free consultation at your home, or in hospital. Let us help you get the results which you deserve, and protect your rights.